Business professionals enter into agreements or transactions with other individuals and businesses nearly every day. The transaction may include an agreement to purchase supplies and raw materials from another party. Agreements may also include services or work to be performed by the professional for another party or work to be performed by another party for the professional. These agreements or transactions are also referred to as contracts. Contracts typically include what work or services will be provided, how much the work or services will cost, and who will pay and when. Contracts can be made orally (verbally) or in writing. Both oral and written contracts can be legally binding. However, if a misunderstanding arises between two parties concerning an oral contract, the dispute becomes a “he said, she said” situation that is far harder to prove in court than a written contract. At best, memories can fade over time and create legitimate disputes between two well-meaning parties. At worst, parties to an oral contract have more opportunity to be disingenuous. Therefore, a well-drafted written contract is a good risk management technique to help avoid misunderstandings and disputes that can lead to professional liability claims and other legal disputes and better protect the interests of a business professional. There is no specific format required for a written contract. Essentially, to be legally binding, most contracts should contain an offer, an acceptance of that offer and the consideration for that offer, which is typically money. A contract cannot offend public policy, such as involving an illegal act or a fraudulent transaction. The contract must be entered into by parties that are legal adults, and those adults should not be under the influence of alcohol or illegal drugs or otherwise under duress. The written contract should identify all parties to the transaction, whether they are individual or corporate. The contract should use the full legal name of the business or individual. The fees should be explained in detail, and the contract should outline when payment of fees is required. In addition, it is important to state when the services or work need to be started and completed. The scope of work section of the contract is critical to spell out exactly what the terms and conditions are in the business transaction. The scope of work section should outline what work or services are to be performed or what materials or products need to be provided. The contract should identify each party’s responsibilities, including what one party is promising to deliver and what the other party agrees to pay or do in exchange. The contract should also indicate any limitations of the services or work or quality of product. The contract should identify how the contract will be terminated or how long the contract will be in place. If it is a one-time exchange of goods or services, the contract should state that the contract will terminated upon completion of the transaction. If the agreement is for continuing services, the contract should indicate how and when the parties can terminate the agreement. 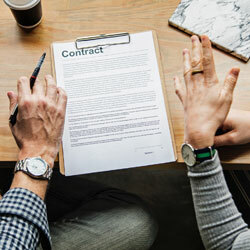 In the event of a breach of contract or a failure to perform by one or more of the parties, the contract should outline how a dispute will be handled, including whether there will be mandatory mediation or arbitration, which is often less expensive than a dispute in court. The contract could designate what state or jurisdiction any dispute should be adjudicated in and whether attorneys’ fees and/or court costs should be awarded. The contract could also state whether some form of liquidated damages should be awarded. All parties to the agreement should sign or execute the contract. Professionals should ensure that the person executing the contract has the legal authority to do so, such as an authorized officer signing for a corporation. All parties should keep copies of the contract for easy reference in the event of a dispute. There are numerous additional considerations for professionals in drafting a written contract that may not apply to every situation. First, it is advisable that professionals consult with an attorney in drafting a contract. Attorneys can often help draft a “form” contract for a business that can be used for the type of work the business conducts. These form contracts then can be utilized on a day-to-day basis to help the business avoid reinventing the wheel for each transaction. In addition, consulting with an attorney can ensure that the written contract will be enforceable in the event of a breach. Second, the parties may wish to keep certain information confidential especially if the transaction involves the exchange of trade secrets or other proprietary information. Third, the parties may wish to provide for any warranties and/or indemnification by one party to the other party to the transaction. Fourth, the contract may address if one party or all parties need to purchase insurance or a bond to protect the other parties to the transaction. Last, if the contract uses key terms, it may be helpful to include a definitions section and explain what each term means to the understanding of the parties. Professionals can minimize their risks by reducing all transactions and agreements to written contracts. By utilizing well-drafted written contracts, businesses and professionals can manage the risks and avoid misunderstandings and confusion that can lead to costly professional liability claims and lawsuits. Brunswick Companies is an independent insurance agency representing only A Rated carriers. We value our carriers’ investments in research and proudly share their market insights. This article reprinted with permission from The Hanover Insurance Group.